The art of good property management is similar to a science. 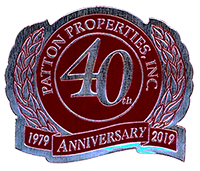 We at Patton Properties, Inc. have taken our 40 years’ experience along with the latest computer technology to create the most up to date methods of marketing and managing investment real estate. This program has been established for and in conjunction with property owners who wish to have their administrative services, marketing, and maintenance duties performed by licensed, experienced real estate professionals. Our Goal is to make owning an investment property as painless and profitable as possible. We put our reputation on the line every day to protect our clients. I am proud to announce that we at Patton Properties have reached a big milestone in the history of the company. We are celebrating our 40th anniversary this year!